Imagine for a moment that you are a teenager, arriving at college for your first year, and that you come from an interfaith family. Perhaps you were raised in one religion, but now, you feel drawn to explore the other religion in your family background. Or perhaps you were raised with both religions, and plan to stay connected to both. Or perhaps you were raised with neither religion, but now plan to explore both family religions, or all religions. Now, imagine you are handed a survey and asked to choose one religion, and only one religion, as your identity. Your only other choices are to choose “none,” or “other religion,” or to skip the question altogether. I went through this thought experiment as I read “The American Freshman,” an annual report released earlier this month, based on a survey of more than 150,000 college freshmen in the annual CIRP (Cooperative Institutional Research Program) survey, produced by the Higher Education Research Institute (HERI) at UCLA. The survey only allows students to pick one religion as their “religious preference.” I suggest that as a result of this restriction, the researchers are missing an opportunity to better understand the changing landscape of American religious identity. As summarized recently by Robert P. Jones of the Public Religion Research Institute, that landscape includes the following: one in five Americans is religiously unaffiliated, a quarter of the unaffiliated still see themselves as religious, one in six Americans follow the teachings or practices of more than one religion, and about one quarter have a spouse or partner of another religious background. This year’s American Freshman survey found that nearly 28% of the students chose “none” as their religious preference, up from some 15% in 1971. And yet, more than 16% of these “religious nones” in 2014 rated their own spirituality as “above average” or in the highest ten percent. I asked Kevin Eagan, the director of HERI, for additional information on the students who came from interfaith families. In 1973, about 22% of students reported having parents with two different religions or denominations (or having one parent with no religion). By 2014, almost 30% had such “religiously discordant” parents. “Unlike race/ethnicity, we have not heard feedback from students or institutions that respondents have felt boxed in by restricting them to just one preference for religion.” I can only reply that both my college-student daughter and my college-bound son do feel boxed in, as do I. And based on the college students I surveyed and interviewed for Being Both, my book on interfaith families, I suspect we’re not the only ones. I also asked Eagan what he thought of the idea that students from interfaith families would check “none” if they could not check more than one box. “I would think that students who wanted to check multiple religions would either skip the question entirely (i.e., be coded as missing data) or choose the option of ‘other religion’ rather than choose ‘none’,” Eagan wrote me. As someone who claims an identity formed by both my Jewish and my Christian heritage, I would not choose “other religion,” a category that seems designed for Sikhs or Jains or Pagans. 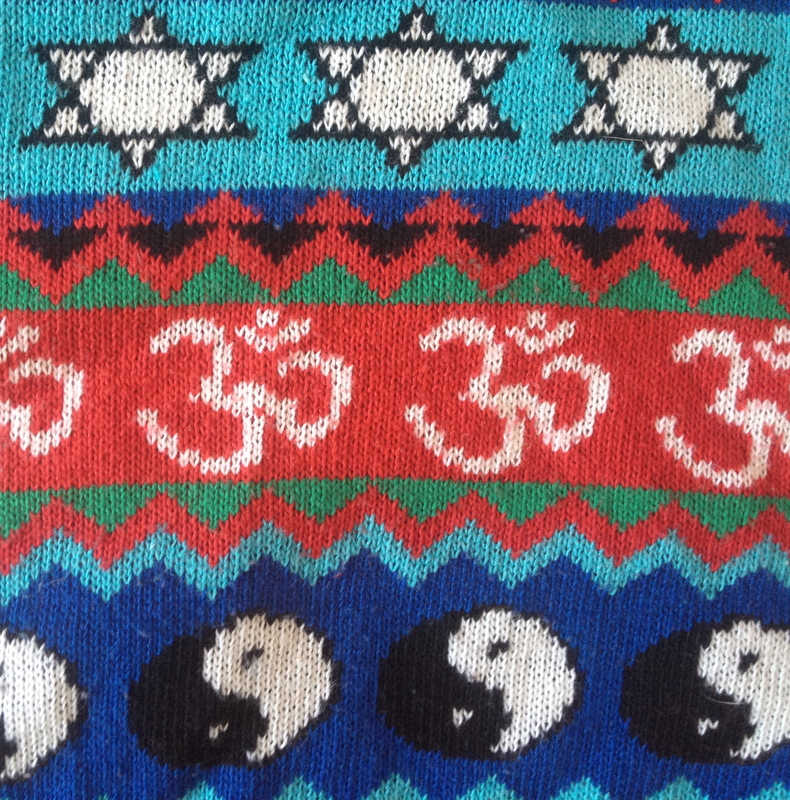 Interfaith is not a religion: it is an identity based on the synergy and symbiosis of two distinct family religions. Often, those of us honoring both family religions are accused of trying to form a new religion. In order to avoid feeding this kind of concern, I would make a point of not checking the “other religion” box. My 18-year-old son says, “At least checking ‘other’ sends the message that they need to expand their options.” But does it send that message? The choice to just skip the question creates the unfortunate result that people with complex religious identities from interfaith families will not be counted or included in the study results on religious identity. And we are tired of not counting. I agree that some students might just skip this question since there would be no way to express their true religious preferences within the parameters of the survey. My argument is that by allowing them to check more than one box, researchers would be able to gather data to better understand the religious identity of these students. There’s a simple solution to all of this. Allow students to check more than one box. Allow them to check both Buddhist and Jewish. Allow them to check, whether or not you agree that it is a valid choice, Jewish and Catholic. The results will be more complex, perhaps harder to summarize. And more true. This essay was first published on Huffington Post. 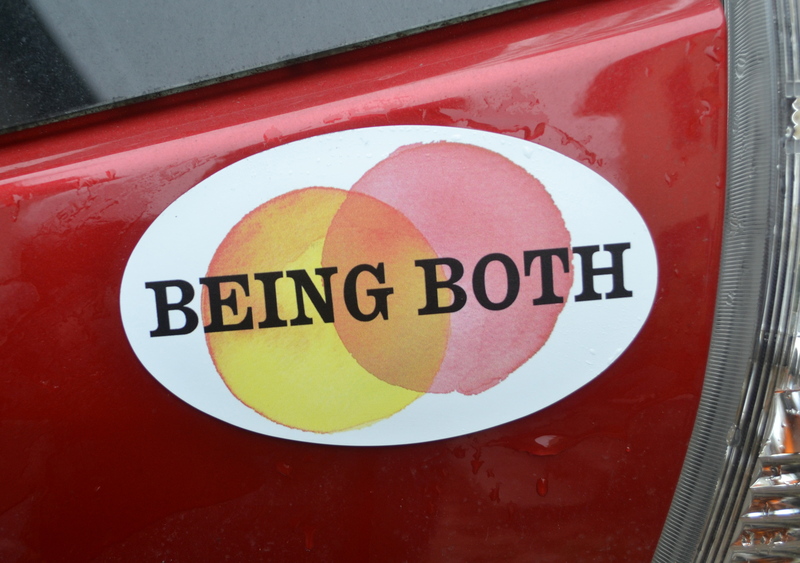 Being Both: Embracing Two Religions in One Interfaith Family is available now in hardcover, paperback and eBook from Beacon Press. This year, Hanukkah ends just in time to give a day of breathing space between the eight-day celebration and the arrival of Christmas. This is how I like my December holidays: completely separate in space and time, while connected by the common threads of family togetherness, feasting, singing, and light at the winter solstice. And this year, the two holidays are just close enough that we will get to light candles for the final night of Hanukkah, and then also celebrate Christmas, with my interfaith parents and all my siblings. It’s a busy time of year for interfaith parents, and it’s also busy for me as a source for stories on interfaith parenting. This year, I allowed a reporter to also interview my son for the first time, for a story on the blog of the PBS Newshour. This story features a Hindu and Christian family, as well as my family, as we move into a less binary interfaith landscape. They also published three of my photos, including the one of the Hanukkah menorah above. Go take a look. (Also, to catch up on the debate over use of the word hanukiyah versus “Hanukkah menorah”, search my twitter feed @beingboth). 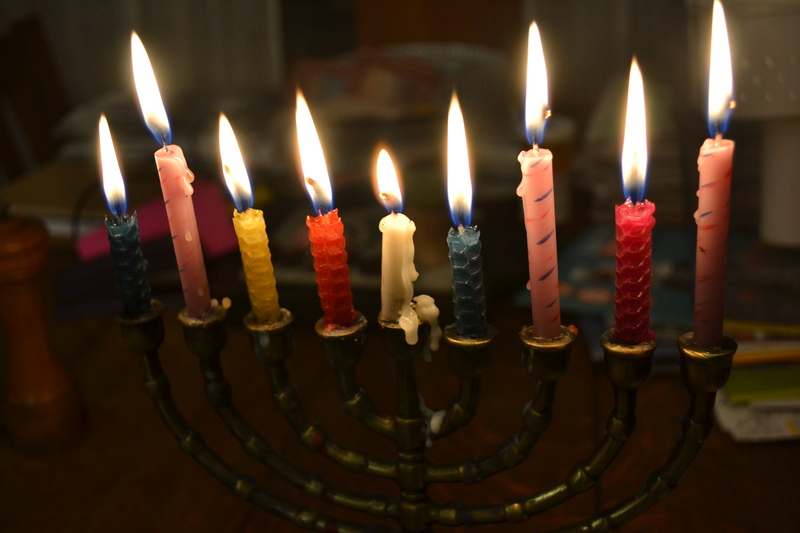 I have an essay entitled “How Not to Spoil Your Interfaith Kids at Christmas and Hanukkah,” my debut on the Jewish parenting site Kveller.com. In this piece, I describe the efforts in our interfaith family to keep the gift-giving under control. Over at Beacon Press, in case you missed it, you can read my essay on “An Interfaith Child’s Christmas and Hanukkah” on Beacon Broadside. Also, you can order books direct from the publisher through the end of the month at 20% off (with free shipping) with the code GIFT20 . Some of my favorite recent Beacon Press books in the religion/worldview category include Faithiest by Chris Stedman, Acts of Faith by Eboo Patel, A History of Religion in 5 1/2 Objects by S. Brent Plate, and a new gift edition of Victor Frankl’s classic Man’s Search for Meaning. To browse through the many, many, many posts I have written on Hanukkah and Christmas over the years, on this blog and on Huffington, just type Christmas Hanukkah in the search box on this blog. And in the new year, I’m looking forward to giving a public lecture at Claremont Lincoln University, in Claremont CA, on January 10th. Let your friends and family in the LA area know that they are welcome to attend. I am sorry to see this year, the first full year with Being Both, the book–a year filled with lovely book adventures and important conversations with so many of you about interfaith families–come to an end. So here’s to more of the same in 2015! And in the last few days of 2014, may all your latkes be warm, and may all your lights be bright, as we head into, and then out of, the darkest days of winter. Being Both: Embracing Two Religions in One Interfaith Family by Susan Katz Miller, a great holiday gift available now in hardcover, paperback and eBook from Beacon Press.